This easy dish highlights black-eyed peas with the tastes of onions, capers, and dill. Because it is often served chilled or at room temperature, we call it a salad, but it makes a wonderful side dish or vegetarian and vegan main dish. Keys to success: use capers that come bottled in vinegar and, if using dried peas instead of canned, salt the water rather than the final dish itself. Day One: Pur the peas into a colander or bowl and check for any damaged peas or debris and discard. 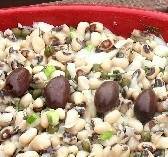 In a large pot, soak the black-eyed peas overnight in plenty of cold water to cover generously. Day Two: Bring the peas to a boil and cook for 5 minutes. Drain and rinse. Wipe any foam residue from the pot and fill with 10-12 cups of fresh cold water. Add sea salt to the water and bring to a full boil. Add peas and when boil resumes, cover, reduce heat to low, and simmer for 40 minutes. Drain peas and transfer to a serving bowl. Toss with remaining ingredients and garnish with olives. Note: A 14oz can of black-eyed peas is about 1 1/2 cups of drained peas. Pour peas into a colander and rinse well under running water. Drain for 20 minutes and transfer to a serving bowl. Toss with remaining ingredients and garnish with olives.